Have you asked your children the question of what they want to be when they grow up? I've asked mine and the answers change on a daily basis. Right now my eldest wants to either be an author or work within something like architecture. My ten year old is all about art and fashion and my eight year old is still eager to become a pop star. Now these all sound like respectable careers but a certain book that came through the post may just influence my youngest in her next job choice . . .
How to Become a Knight (in Ten Easy Lessons) is the latest picture book from author Todd Tarpley. 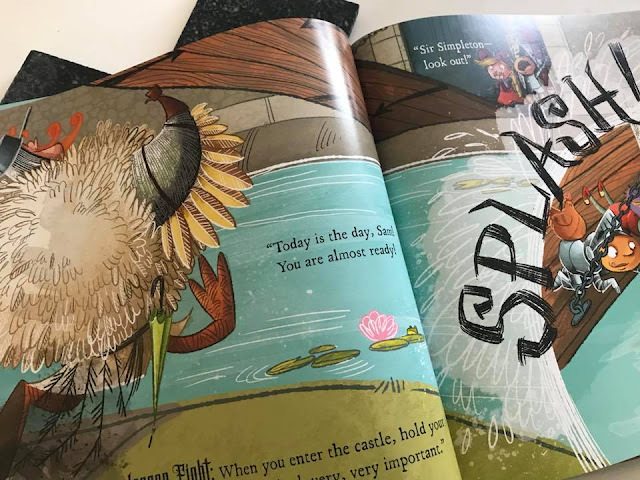 Illustrated by Jenn Harney, this story tells the tale of Sir Simpleton, his student Sam and his quest to give the King a new skilled knight. Knight Needed. Apply at Castle. 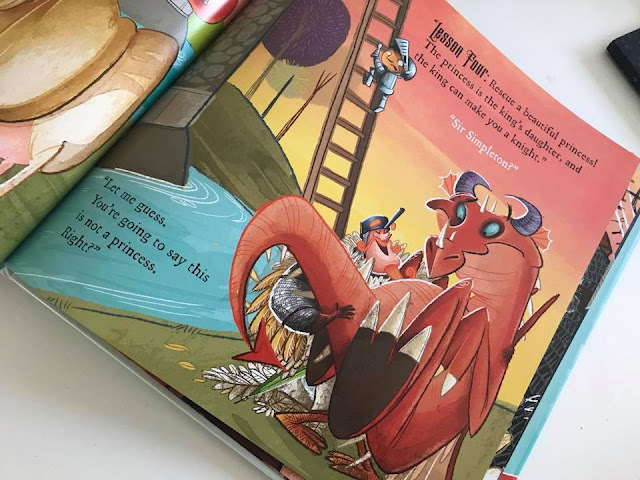 In just one week, the king will choose a new knight - and since Sir Simpleton is the world's greatest expert on so many things, he intends to make sure young Sam masters all the skills he needs to know. Unfortunately, Sir Simpleton may not be the best trainer; Instead of donning shiny armour and rescuing a beautiful princess, he wears a chicken suit and saves a fiery dragon! Will Sam succeed in spite of his teacher's best efforts? Right from the first page, this book is highly entertaining. Short simple sentences alongside wonderfully drawn images really bring the tale to life. And as the story progresses we learn one lesson at a time. From what to wear and what to ride to what to kill and who to save. Poor Sir Simpleton seems to know the right things to say but not quite how to execute his actions. A phrase comes to mind . . .
"Should have gone to Specsavers." With each lesson taught, Sam becomes more and more frustrated with his teacher but could he actually be learning something despite all the mistakes that he's being shown? You'll have to read How to Become a Knight for yourself to see just how it ends but I will say that they live sort of happily ever after. Now this book is hilarious, I mean we all get a laugh out of things when they appear to go wrong don't we but the question that you can ask your children is what can they do if something were to go wrong for them. Should they give up or would it be better to try again. And that's part of the lesson learnt in this tale is that with practice you can succeed so try, try, try again. "Do as I say not as I do." 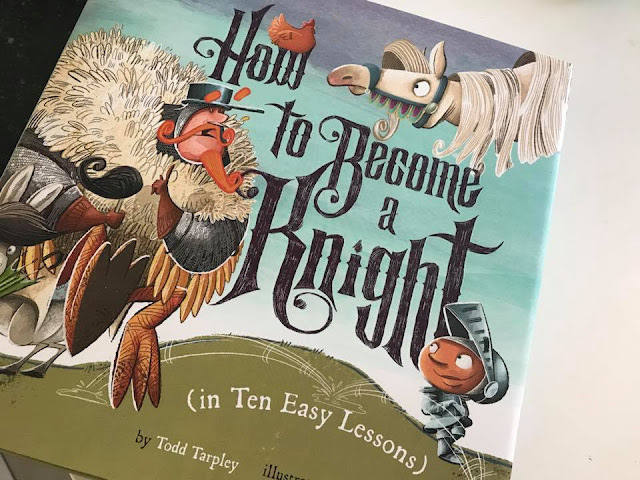 How to Become a Knight (in Ten Easy Lessons) is very funny indeed, it's a lighthearted tale with great lessons mixed in for good measure. I'm not sure I'll be rushing out to become a knight any time soon but if I were to pick that as my next job I'd definitely take Sir Simpleton's advice because as he tells us, he's the expert! This sounds like a really good read for little ones. One for my niece and nephew for Christmas, maybe? This sounds like a fun story. I love the sound of Sir Simpleton and really want to know how the story ends! I love picture books like and it makes me a little sad that KayCee and Ella are too old for them now!